The Group Report Settings and Delivery dialog allows you to change some attributes of Group Reports. Group Report are shown when you select a group in the navigation pane. They can also be shown in a browser. To display the Group Report Settings and Delivery dialog, go to "Report Settings" and select the "Group Settings" command item for the group whose group report options that you wish to work with, as shown. Next, you will see the Group Report Settings and Delivery dialog displayed, as shown. Here you can change the appearance and some characteristics of the Group Reports displays. To change characteristics of the Visual Status Map, select the report in the list box at the top of the display and press the Edit Report Settings button. To change the report that is initially displayed when the group is selected by the user, select the report in the dropdown list labeled "Report to show when...". The check box labeled "Automatically navigate..." allows you to enable the feature that rotates the Server Group display through the various types of Server Group reports. When this check box is selected, the display will show each of the report types in succession, and will pause at each report type for the number of seconds that have been specified in the box to the right. "Select the Email Actions to send the reports to" allows you to specify which email addresses that the reports will periodically get sent to. You can add new email addresses, in addition to the pre-configured email addresses that are already available. "Select the reports that will be emailed" allows you to select which of the three types of group reports that will be emailed at intervals by the program. This will remove navigation links from the reports so clients won't be able to browse to other clients' reports. Naturally navigation within the Console will be unaffected. The Status Map Editor dialog is displayed when you choose the Visual Status Map item in the list and press the Edit Report Settings button. A variety of map graphics are available by default, and you can add your own. The Status Map Editor allows you to select one of a number of included graphical maps of the world and of world regions that can be used as a background for the server status lights. You need to manually place the groups or servers that you want on the map graphic. They do not show up automatically. The functions provided by the Status Map editor are as follows. You can select a background map for this group's Visual Status Map display from one of a number of public domain and government provided maps that are installed with PA Server Monitor. Alternatively, you can use the "Add" button next to the background map selection list in order to provide your own map graphic file. Your map file must be in one of the common graphical image file formats: BMP, GIF, JPEG, PNG, and TIF are supported. The "Zoom" Slider allows you to set the zoom of the background map. You can move the map image by left clicking and dragging the image. The "Use Status Lights" and "Use Status Icons" selection allows you to customize the way PA Server Monitor displays the status indicators. Status lights are simple light images that can appear green, grey, yellow or red. Status icons are round images that have the same color coding as the status light but add an icon symbol inside each image: green contains a check, yellow is a triangle and contains an exclamation, and red is round with an exclamation. 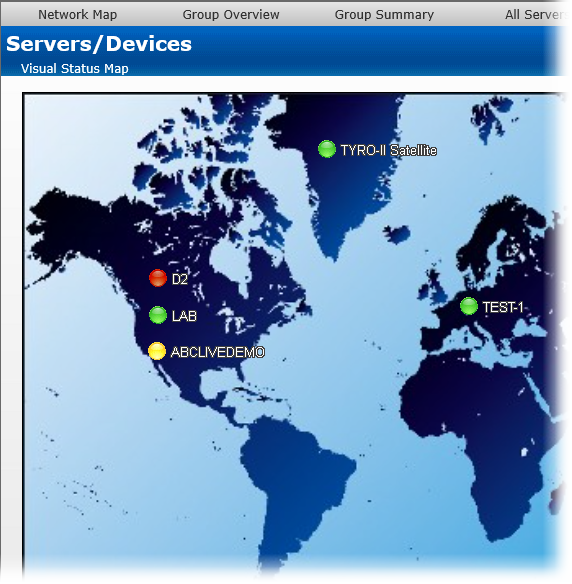 The list of Servers/Devices allows you to select a computer in the group whose status indicator should be added to the map. Pressing the "Add Status Icon" button with a computer selected in the Servers/Devices list will cause a status indicator for the computer to be added to the map. To remove a status indicator from the map, drag it back to the Servers/Devices list. The three radio button selections: "Label on left", "Label on right", and "No Label", allows you to select the text labeling style that is to be applied to each status indicator. You should set these radio buttons to choose the style for the indicator that you place next. You can "flip" the label in a certain direction so that a city name or feature on the underlying map is clearer. You can also not apply a label to certain indicators. When viewing the status map with a browser or in the Console, the map graphic will be stretched or shrunk as needed to fill the browser window that holds it. The icons will be moved appropriately so they remain in the same relative location on the map. The following report display for a properly configured Status Map is typical. In this example, the map indicator and background map display was configured using the settings shown in the Status Map Editor figure above.